Ephraim Mojalefa Ngatane was born in Maseru, Lesotho (then Basutoland) in 1938, moving to Johannesburg in about 1943. He was educated at Mooki Memorial School, where his talent was recognised and promoted from an early age by his primary school teacher, Mrs E.L. Mooki, and later at the Orlando High School in Soweto. Between 1952 and 1954, he studied painting at the Polly Street Art Centre under Cecil Skotnes (qv. ), later going on to teach at the centre in its various manifestations. Though an important figure inside its environment and credited with influencing and developing several major talents – notably those of Dumile Feni (qv. ), Louis Maqhubela (qv.) and Ben Macala – Ngatane’s concern was for an often politically charged, though equally often celebratory, documentary realism. In this and his resistance to primitivising expressionism, he stands outside of the stylistic mainstream in the Polly Street and Jubilee Centre environment. In 1955, Ngatane joined the seminal ‘weekend painters’ group initiated by Durant Sihlali (qv.) – from whom he also received some instruction at the Polly Street and Jubilee Centres. In the debate which characterised the weekend workshops, other, more naturalistic and documentary options were explored than those promoted in the formal teaching situation; a distinctively painterly, psychologising and realist tenor came to characterise Ngatane’s work – and, in time, to define a virtual alternative tradition to that of township expressionism. In 1964, already well established as a professional artist and having held two solo exhibitions, while also making ends meet by painting ceramic pots at the Majolica Pottery in Doornfontein, Johannesburg, Ngatane was hospitalised with tuberculosis at the Charles Hurwitz South African National Tuberculosis Sanatorium in Soweto. 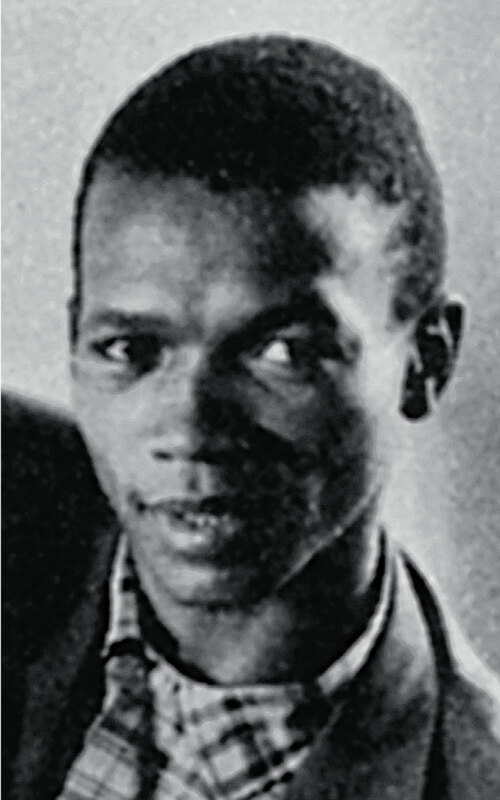 It was during his confinement that he encountered and inspired the young Dumile Feni, who found in Ngatane a model for his own headstrong practice as an artist. Ngatane and Dumile produced a series of murals at the sanatorium, most of which however, have subsequently been painted over. While his work, over time, explored several different registers – from documentary realism to an abstracting painterliness, to a politically charged use of religious symbolism – what defines the importance of Ngatane’s work, as well as his influence on his contemporaries, is its uncompromising concern for the gritty and atmospheric representation of township experience in the South African context of the time. Apart from being a painter whose importance in the development of South African traditions is increasingly acknowledged, Ngatane was also an accomplished alto-saxopohonist in the jazz idiom. He died of tuberculosis in 1971 at 33 years of age. Born Maseru, Lesotho, 1938; died Soweto, 1971. Training 1952–1954: Studied at the Polly Street Art Centre under Cecil Skotnes (qv.). Exhibitions 1960: Artists of Fame and Promise, Lawrence Adler Galleries, Johannesburg. 1962: Solo exhibition, Cape Town. Solo exhibition, Pretoria. Artists of Fame and Promise, Adler Fielding Galleries, Johannesburg. Solo exhibition, Adler Fielding Galleries, Johannesburg. 1963: Solo Exhibition, Adler Fielding Galleries, Johannesburg; Polly Street Artists, Lidchi Art Gallery, Cape Town. 1964: Solo Exhibition, Adler Fielding Galleries, Johannesburg; Transvaal Artists, William Humphreys Art Gallery, Kimberley. 1965: African Art 1965, Adler Fielding Galleries, Johannesburg. 1966: Republic Festival Exhibition, Pretoria; African Art Exhibition, Piccadilly Gallery, London; Solo Exhibition, Adler Fielding Galleries, Johannesburg. 1969: Champs Elysees Gallery, Johannesburg; Polly Street Artists, Helen de Leeuw Gallery, Johannesburg. 1971: Champs Elysées Gallery, Johannesburg. 1972: Group Show, Gallery 101. 1981: Black Art Today, Jabulani Standard Bank, Soweto. 1983: Group Show, Gallery 21. 1986–7: Johannesburg Art and Artists: Selections from a Century, Johannesburg Art Gallery. Collections Pretoria Art Museum; Sandton Town Council Collection; William Humphreys Art Gallery, Kimberley; University of the Witwatersrand Collection, Johannesburg. Ephraim Ngatane. Source: Esmé Berman. 1983. Art and Artists of South Africa. A.A. Balkema: Cape Town/Rotterdam. p. 339.